After an election fraught with misinformation, fake news, and hoaxes on all sides, students found it difficult to navigate digital media not only for scholarship but in their personal lives. Librarians at LMU conducted information literacy workshops to engage students with meaningful current news outlets and news stories from all political ideologies as a part of a campus-wide teach-in on Inauguration Day 2017. This presentation will provide an overview of these workshops and explain how librarians can implement similar programs while responding to a politically and emotionally-charged campus and public environment. This presentation will also discuss the workshop development process, which includes defining how information literacy may be applied to born-digital source material, possible learning outcomes for attendees, tools for managing misinformation, collaborating with pre-existing campus-wide programming, and examples of active learning opportunities for students to evaluate their own biases and perspectives both in and out of the session. Attendees will have the opportunity to perform activities from the workshop and discuss how these can be implemented for school and public libraries and for more general community-based learning. Additionally, the workshop will discuss the assessment process and the real-time feedback received in the workshops from members of the campus community. While these workshops occurred in an academic environment, the workshop materials can be tweaked for every library and audience. Librarians know that information literacy education has been done for a very long time, however, it must have real life applications in order for patrons to continue to critically engage with information and examine how they disseminate information to their personal networks. Conner-Gaten, Aisha, Desirae Zingarelli-Sweet, and Jennifer Masunaga. 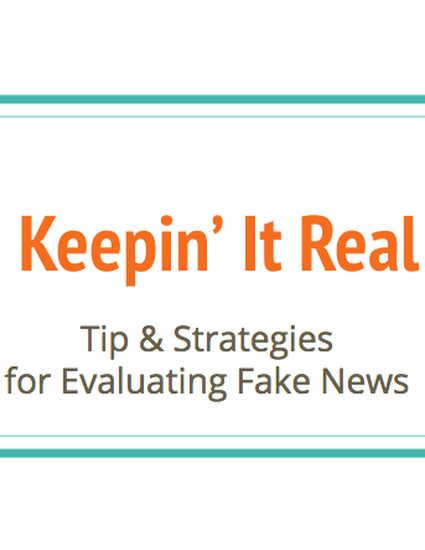 “Keepin’ It Real: Tips and Strategies for Evaluating Fake News.” Lifelong Information Literacy Conference, 31 July 2017, Glendale Community College, Glendale, CA. Active learning presentation.